Do you want to learn how to sail a boat or yacht properly? If so, then you come across the right article. This article has been written with an intention to provide you with basic information on the art of sailing a boat. Sailing a boat is a thrilling experience. It is important to note that a boat is primarily a sort of floating island keeping you as well as crew save from drowning. A sailor has to keep full control over a boat in order to ensure the safety of people onboard. If the sailor does not do so, something wrong is likely to happen. The boat may go out control and can cause you and the crew to fall off it. Therefore, as a sailor, you should know what you are doing while sailing a boat. The first more important thing you need to do is to know your yacht. You might familiarize yourself with all components of the yacht, such as engine, lines, sails and the emergency equipment of the boat. This stuff is available on almost every yacht as these are necessary equipment. Therefore, you should check on the equipment before starting a voyage. Go over the yacht and make certain nothing is wrong with it. You need to pay special attention to its engine as well as safety gear. Participate in the crew meeting and make sure you as well as each crew member understand the roles and responsibilities assigned on the yacht. You and the whole crew should know the basic techniques of sailing, operating the radio and dealing with emergencies. An emergency is a situation where decisions should be taken quickly and wisely. If you been assigned the role of a skipper, you should allot crew positions and test every member of the crew to make sure they know the basic sailing skills so that they could sail the yacht in case the skipper falls too sick to sail the yacht. Set off into the water under motor power. If the yacht contains no motor, leaving the slip and harbor under the power of sail is another option. Actually, motor gives you more control over the yacht and helps you prevent collisions on close quarters of the harbor. Set your sails into open water. Turn the bow of your yacht into the wind and lift the main sail, when you are ready to set off. When the main sail is up, you need to lift the jib. In case you are using a furling jib, you should turn the boat to a certain track, unfurl the jib slowly, and set it. Keep your eyes open and stay alert. You may get caught up while enjoying the sailing. Therefore, it is of paramount importance that at least one member of the crew must keep an eye on the water for obstacles, potential collisions or bad weather. Staying active is the most important factor that should not be neglected while sailing a yacht. Good luck with your sailing! 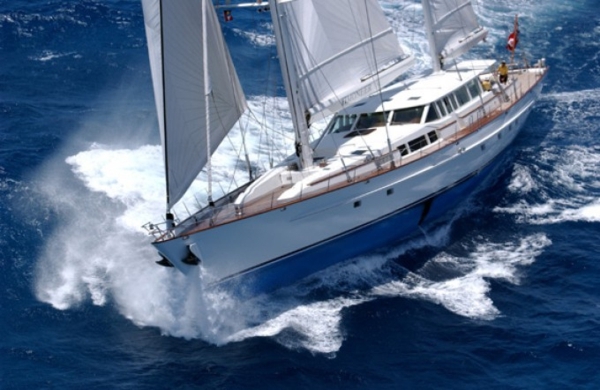 Learn how to sail a yacht with online sailing courses from NauticEd sailing school.